Summers always hold the possibility of the unexpected. Bucket lists, vacations to new destinations, spontaneity. My summer was filled with such unexpected activities and outings to places I’ve never been, but of a different variety. My mom, a recent empty nester since I came to college, had an idea. She was going to turn the granola she and her mother had been making since she was a kid into a company. She was going to account for all those now trendy dietary restrictions that mark the products lining Whole Foods’ shelves—gluten-free, vegan, low glycemic. She was going to live that ‘Shark Tank’ dream and make a hit product. And she did. Well…she’s on her way. Last winter, Dragonfly Granola was just an idea. By the spring, she was baking in a commercial kitchen and starting to sell at a Farmers’ Market on Sundays. This summer, one shift at the commercial kitchen turned into two and that one Farmers’ Market turned into four. In a few weeks, I will be going home for the weekend to help fulfill an order for 250 bags of Fig Hazelnut granola for one of the biggest artisanal grocery stores in New York. The first time my mom and I went to that commercial kitchen, she dropped a tray of granola and I sliced my finger on a knife. Over the weeks, we’ve learned how to use the industrial dishwasher and operate the walk-in oven. We’ve graduated from making batches 5 times the original recipe size to making 20 times. We’ve developed new flavors (our Chocolate Espresso with Almonds is a personal favorite) and had barcodes made for the products. This summer put my basic economics to a test as I struggled to determine wholesale vs. retail pricing, and how to account for all costs to determine profit. It taught me the New York State code for food sanitation and just what coconut sugar is. It is true. This is expensive granola. And if I were one of those samplers, I might have considered buying a bag of Dragonfly Granola and then decided I would get dinner out one night instead. But when you have contributed to every bag, watching ingredients become a product, $12 seems like not much to pay. I’ve learned that buying pistachios in bulk is shockingly expensive, and getting every bag to weigh exactly 14 ounces is hard. Owning a small business is a dream, but it’s incredibly difficult in the age of Walmart and comparable bags of granola that cost $5. 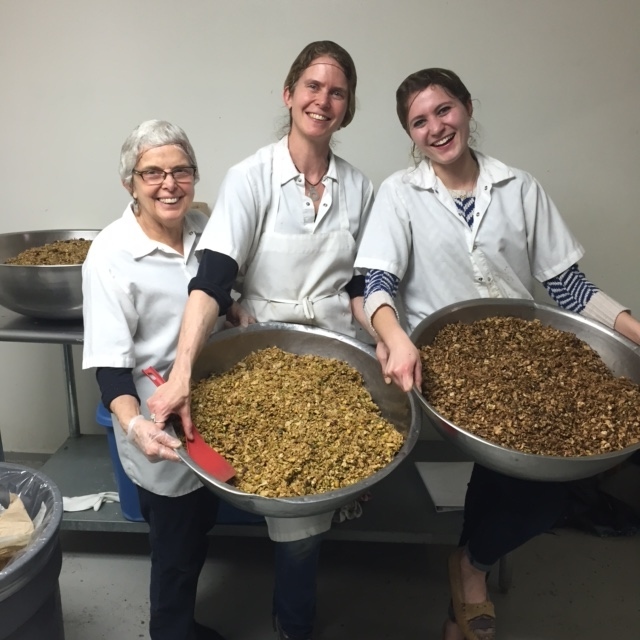 The difference is that Dragonfly Granola is made by hand (literally.) Those oats from Maine were measured by me, and mixed by my mom. The labels were affixed to the bags as an excuse to watch some bad reality TV. This granola has become my mom’s second child and she treats it with as much care, love, and affection as she would a baby. The parting gift from my mom as I left for school this fall was a bag of granola. As I use it to top my d-hall oatmeal, I can’t help but think ahead to a day when HUDS provides Dragonfly Granola. Or maybe that’s just much too wishful thinking. Instead, I imagine a day when Dragonfly Granola doesn’t come in a care package from home, but from a Cambridge Whole Foods. To a day when a factory seals the bags and the oven accommodates hundreds of trays. And being able to remember what it was like at the very beginning. Basia, her mother, and her grandmother making granola a family affair. Be sure to check out dragonflygranola.com to shop online for delicious granola!